Carla Stewart here. My series on Route 66 wouldn't be complete without exploring its importance during the Great Depression. It was, after all, John Steinbeck who traveled this historic ribbon of highway and dubbed it The Mother Road. If you're just now joining us and want to read more of the series, here are the previous posts: Santa Monica Pier, America's Main Street, and Route 66: More Tales from the Trail. One thing I've learned as a writer is that the more I learn about a subject, the more there is to know. 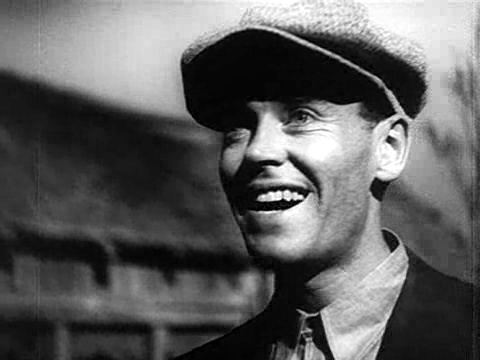 Although I've seen the movie The Grapes of Wrath and was, and still am, struck with the rawness of what it must have been like during the Depression of the 1930s, I didn't fully grasp Steinbeck's passion about telling the story of the Joad's until I read Children of the Dust Bowl by Jerry Stanley (I highly recommend it!). It's a thin book loaded with pictures and tells a powerful story. The economic crash of 1929 thrust our nation into the throes of the Great Depression, but it was a drought combined with poor farming practices, failing crops, and low prices that burdened the "heartland" of America even more. Years of boiling dust storms compounded the problems, especially for people in the "Dust Bowl" - an area covering parts of Oklahoma, Kansas, Texas, Colorado, and New Mexico. 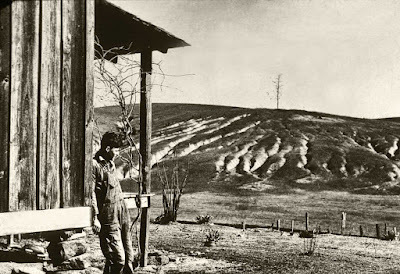 Erosion of farm land during the Dust Bowl. Photo courtesy of Wiki Commons. A Child of the Dust Bowl. Photo courtesy of Wiki Commons. Printed flyers from California began to arrive in drought-ridden areas with promises of food, work, and continuous sunshine. For those who had reached the limit of their resources and saw nothing but more dark days ahead, it was viewed as a ray of hope. The Mother Road became the exodus to a better life. 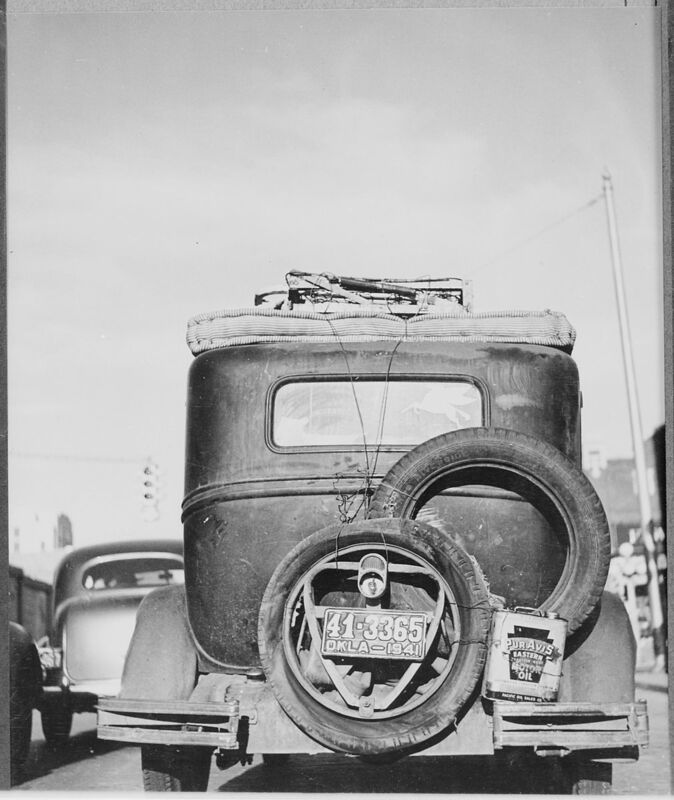 More than one million people loaded all their belongings in jalopies and flatbed trucks and set out for the Promised Land along, you guessed it - Route 66. Getting there, for some, took months as they traveled through blast-furnace heat, winding mountain roads, bridgeless rocky paths, and washed-out mud banks. Hunger and uncertainty were constant companions. They cooked outside, slept outside, went to the bathroom in the woods, and did it all again the next day. Many didn't make it over the Black Mountains of Arizona or the 143-miles of desert that greeted them when they did reach California. IF YOU ARE LOOKING FOR WORK - KEEP OUT! 10 MEN FOR EVERY JOB! The migrants were relegated to camping out in tents or shacks made from cardboard or tin, gathering together in shared agony at the bottoms of dry lake beds. These squatter camps became known as Okievilles - places that John Steinbeck visited and which became the inspiration for The Grapes of Wrath. 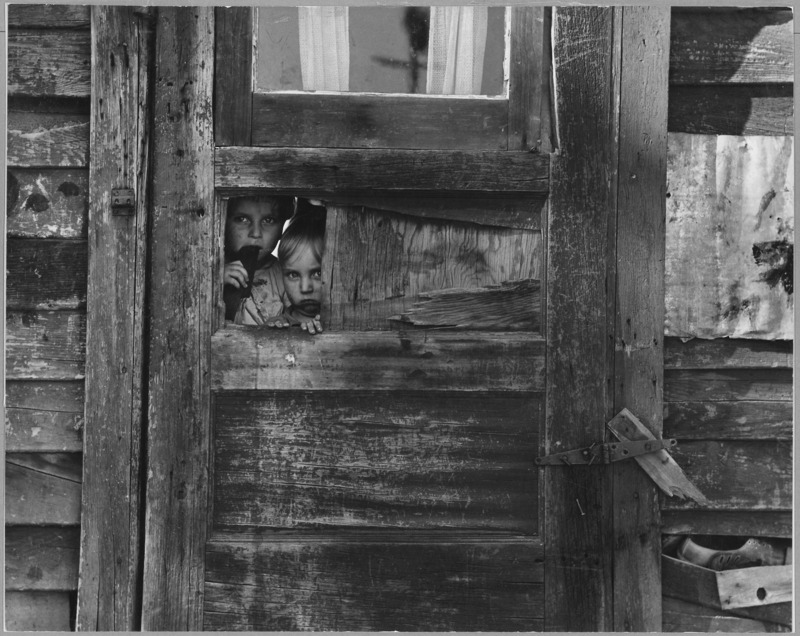 In 1936, the federal government, via the Farm Security Administration, began building camps for the displaced Okies to provide emergency shelter and improved living conditions. People flocked to them, grateful for the one room cabins or tents on wooden platforms. The cost: $1.00 per week. Many couldn't afford this, but were allowed to work off their rent doing maintenance and other jobs. One of the camps was situated on Weedpatch Highway, and Okies called it Weedpatch Camp (the name Steinbeck used in his novel). As they tried to enter into community life, they were shunned and ridiculed. Okies were thought to be ignorant and filthy and were banned from shopping in many towns. California parents didn't want "Okies" going to school with their children. "Okies, go home!" was the battle cry of citizens across the state. In school, little girls were called "maggie" and "maggot," a play on the word "migrant." Between Weedpatch and Lamont, Kern County, California. Children living in camp. Photo courtesy of Wiki Commons. Steinbeck wrote The Grapes of Wrath from compassion mixed with revulsion that people would be subjected to such treatment in America. The novel was published in 1939, sold 500,000 copies before the end of the year, and won the Pulitzer prize. It also created great controversy followed by a movement to ban the book from schools and libraries. Californians said it was one-sided in favor of the Okies. Others said it was obscene. An Oklahoma Congressman called if "the black, infernal creation of a twisted, distorted mind." Although it was banned in its day, it is still considered by many to be the greatest novel ever written. 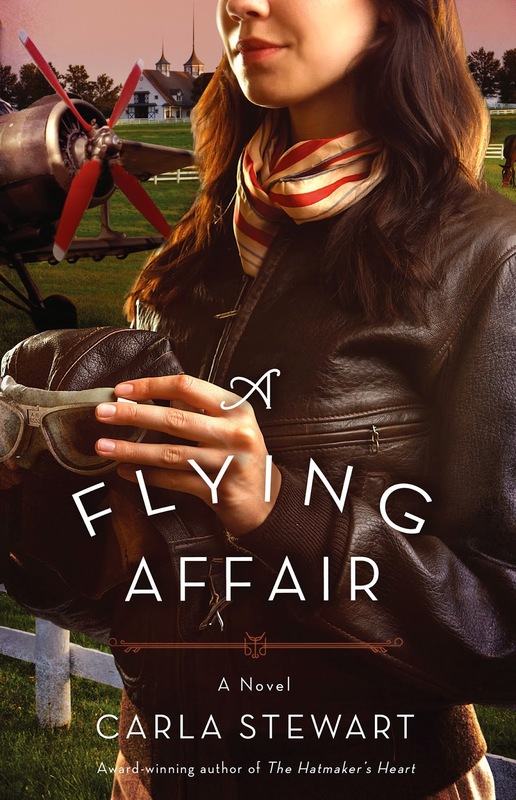 More than 14 million copies have been sold. 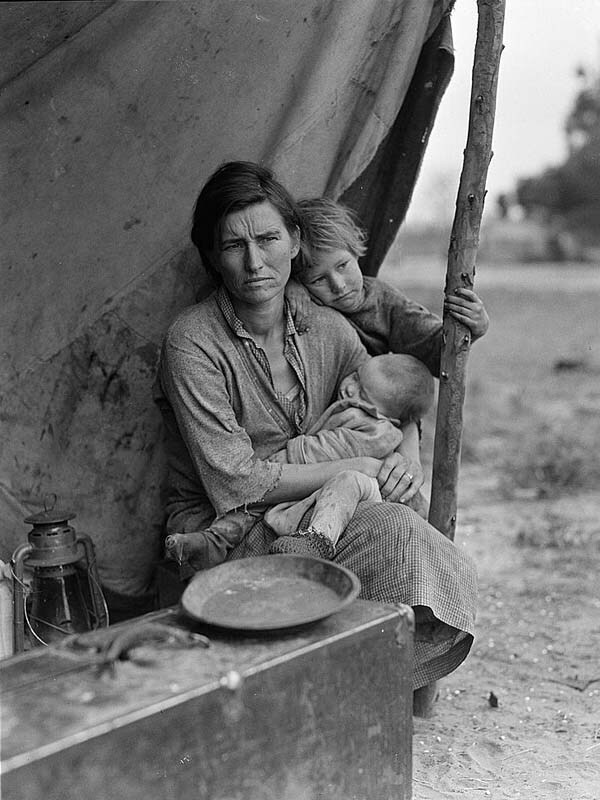 Florence Thompson, an "Okie" of Cherokee heritage, known as the Migrant Mother. Photographed by Dorothea Lange in California. Photo courtesy of Wiki Commons. The story doesn't end there. The Okies of Weedpatch Camp and the ten or so other camps built in California were a resilient people. They never lost hope and always believed that tomorrow would bring better fortune. When a unique school was constructed at Weedpatch Camp that employed a host of excellent teachers and taught both traditional and vocational courses, it became the envy of other citizens in the county. Soon people were petitioning to let their children attend Weedpatch School. Many of the "Okies" who attended went on to become businessmen, educators, and successful entrepreneurs. Part of my interest and passion for including this in my Route 66 series is personal. 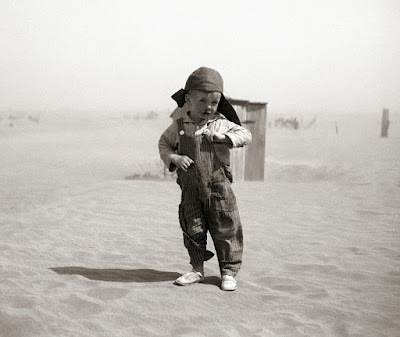 My parents both grew up in the middle of the Dust Bowl. My mother's family (her parents and four little girls) were among the Okies who migrated to California in hopes of a better life. I don't know if Weedpatch was the camp they lived in or where my mother attended first grade. I don't know whether she was treated shabbily or called ugly names. I don't know whether Grandpa found work or not, only that Mother said they nearly starved. As for school, she said she learned nothing the year they spent in California. Disappointed and discouraged, they returned to Oklahoma. So while Route 66 is, and always will be, about the people who traveled it, I like to think that the Mother Road is also the road home. My dad lived through the dust bowl. He told me how nearly everything they ate was crunchy from the dirt. He said his mother would hang wet sheets on the doors and windows in hopes of keeping out some of the dirt. It was an awful time for children. Many of them died from black lung--I think that's the term--caused by breathing in so much dust. It was a hard time but proves how resilient the American people are. Thanks, Vickie, for sharing your dad's experiences. I'm doing deep research now on all of the things you mentioned for my next book. Dust pneumonia is similar to black lung and many people died from it or ended up with weak lungs. I've been interviewing people who lived through that time. And yes, people who lived through it were resilient! Cheers! Wonderful article! My WIP is a story during the Great Depression, but in Iowa. I don't think they had it as bad up there - as far as dust storm went. Such a hard time to live through. Connie, good luck with your story. It's a fascinating time in history, I think. And the depression affected all of the nation for sure. Blessings!